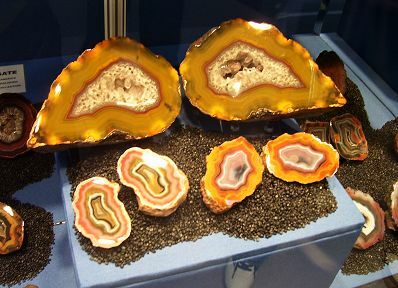 This year the theme for the show was agates. 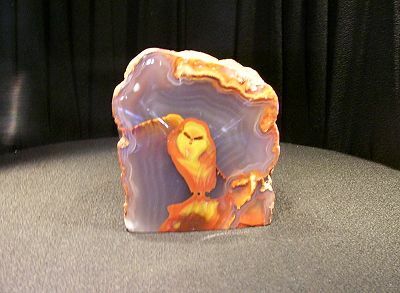 Agates are primarily comprised of quartz. No big deal but when you add some impurities while the agates are forming you can end up with some very odd and interesting results. 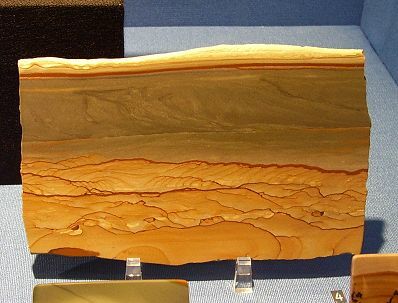 I personally do not care for agates but I was impressed by what I saw here at the show. 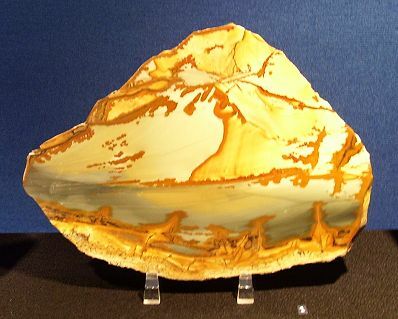 There were literally thousands of agates on display here at the show so to picture them all would be impractical. This will portray some of the more interesting items seen here though. 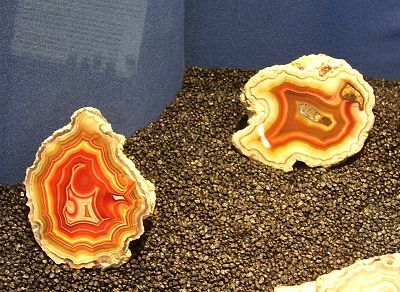 The entrance to the agate displays. Here is the 10 cm model for the banner ad for this year's show. A wise old owl. 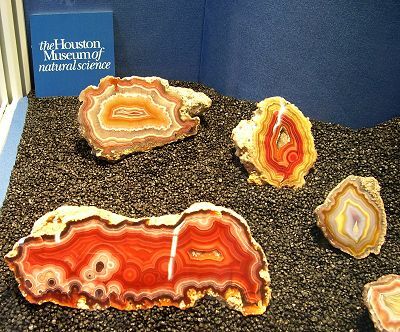 The Houston museum had some very attractive Mexican agates. Two more from the Houston Museum display. 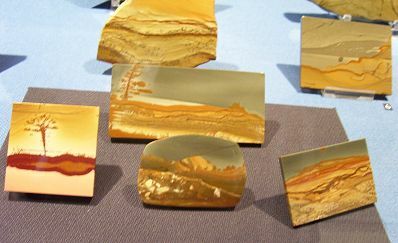 This display was very interesting with its picture agates with a western USA theme..
A group of picture agates. 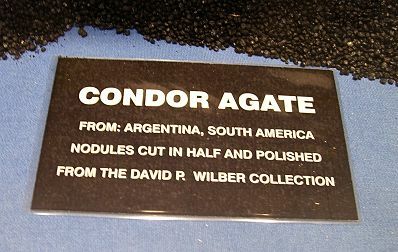 During the show I chatted with Herb Obodda and he had glowing comments about David Wilber's case of Condor Agates and urged me to check it out. A nice group all in all over over 100 agates were on display in Wilber's case. few days under hot lights. The plastic wrapper had a fair amount of "sweat" of condensation on it... Nice work here Dave! 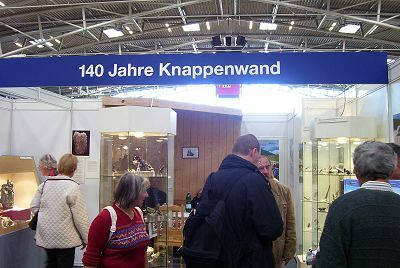 There were an array of displays also in Hall A4. I found a few of them quite interesting. had previously passed through my hands back when Rob Lavinsky and I had that collection in 1998. Specimens with the original labels from the late 1700's and early 1800s. 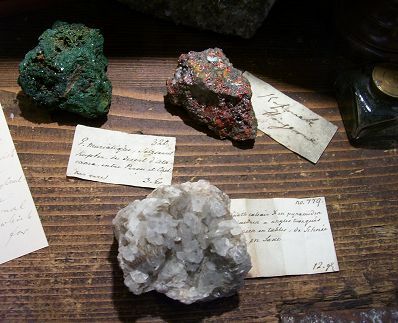 A specimen of malachite from Russia with a label written by Heuland. 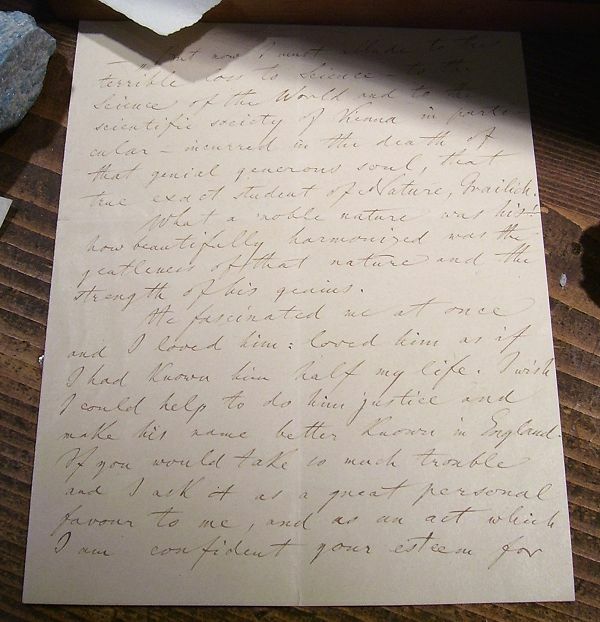 A partial letter in reference to Ferguson. I don't know who wrote it. I thought this was great display! 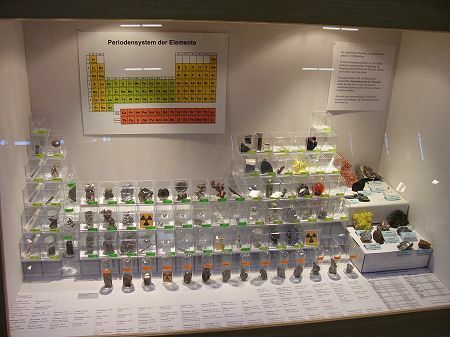 Actual specimens of every element (those that are possible) in the periodic table. Some rare stuff in these glass tubes! The money section of the table. 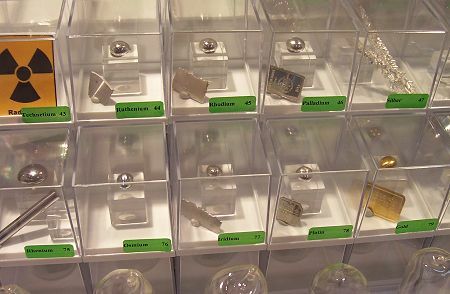 Gold, Silver, Platinum, etc. A really nice specimen of crystallized niobium! 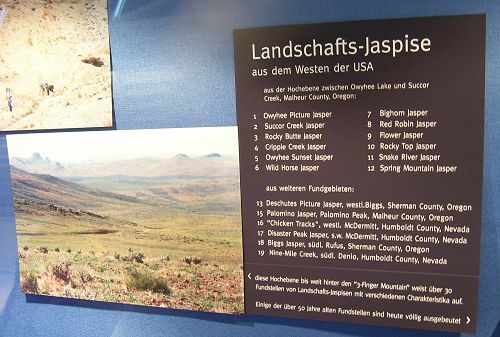 Near the center of Hall A4 was display on epidotes from the classic locality - Knappenwand, Austria. 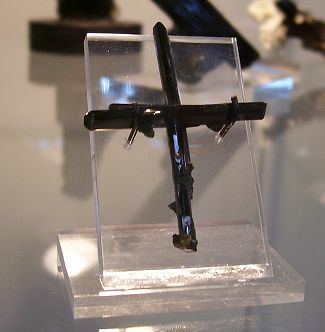 A nearly perfect cross of epidote 4 cm from top to bottom. 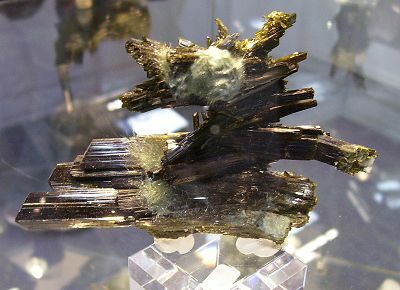 A 5 cm specimen of epidote with byssolite. 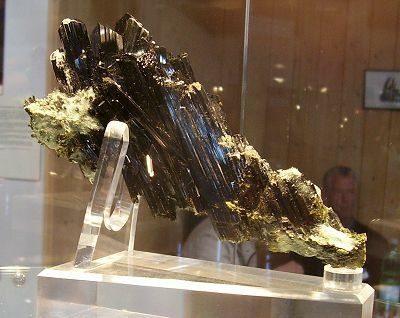 A 15 cm specimen of epidote with byssolite. There were some great minerals here and for me the warikahnite was the top find. Finding bargains was hard with the US Dollar still trading at $1.21 per Euro but with digging and persuasive begging there were some good deals here. 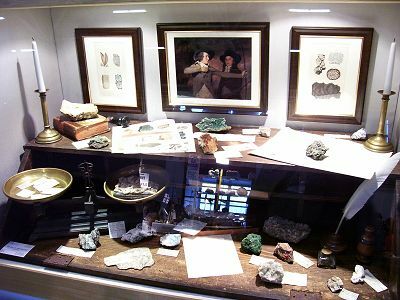 Discussions with other folks from the US had the same tone overall in that the costs of a trip here and purchasing specimens have risen dramatically in the past few years. Things like this are cyclic of course and the day will come again when those of us who use US Dollars will be fairing better but that is not the case at this time. Looking around, however, at the price people are paying for gasoline here things aren't so bad. People here pay an average of 1.26 euros per liter of gasoline. That translates to 4.78 euros per gallon of gasoline. With the euro at $1.21 per euro a gallon of gasoline costs $5.80!! There is a continent of people who would jump for joy at the prospect of paying $4 a gallon. They would think that they'd died and gone to heaven to be able to pay $3 which is what we average in the US. 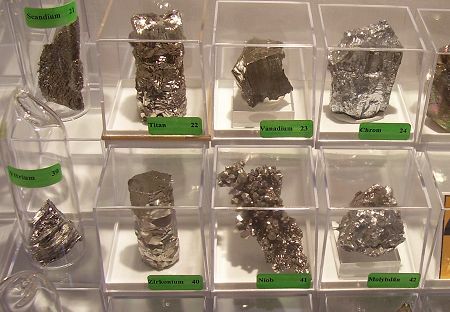 China is the hot spot for new minerals coming to the market and the quality is continuing to improve. 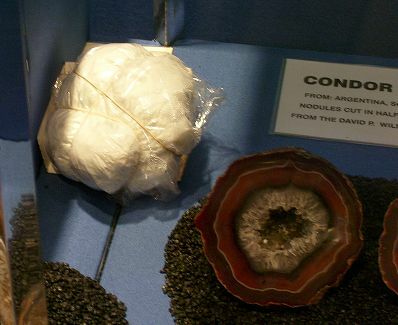 The other bulk of other interesting material was from released collections. 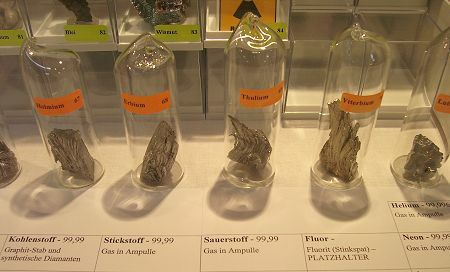 Prices for the better specimens were generally pretty high here - even for folks who spend Euros. Those dealers who had quality material - not necessarily the top shelf stuff - did a brisk trade here. No matter how you analyze it the 2005 Munich Show was a good show and well worth the trip here. Lots of great minerals, good friends, conversations about minerals, and a friendly atmosphere make this one of the important mineral events of the year. Given the difficulty for travel to the US for foreign nationals posed by the Patriot Act the Munich Show is probably now the most important show in the world. More international dealers are found here than at Tucson and they can make the trip with less difficulty and chance for damage to their material. I have heard numerous horror stories from foreign dealers who had specimens needlessly damaged by the reckless handling of US Customs agents. If you have never been here before you may as well plan on a few trips because it is not possible to see everything with a discerning eye in the few days the show is open. It is quite daunting. 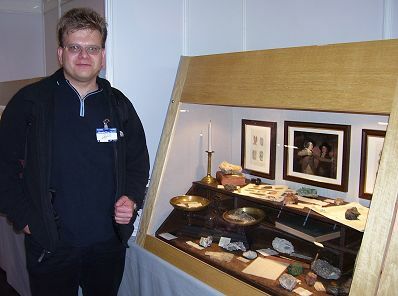 A word of thanks to Johannes Keilmann and his staff who pull off a miracle here each year organizing the show and keeping disasters and crises out of the public view. I don't think anyone really knows just how hard it is to put a show like this together as seemingly effortless as it appears. It is a joy to be here each year and something I look forward to. Thanks also to Robert Keilmann for your help with the web connection here in Munich. 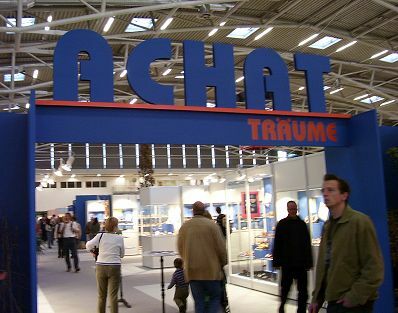 This is the image that will adorn the program guide for the 2006 Munich Show. 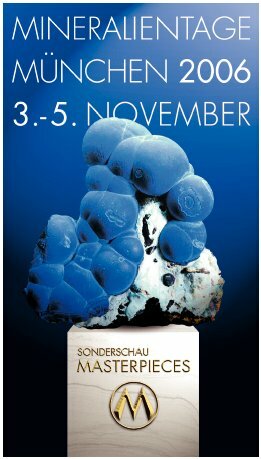 The theme will be mineral masterpieces - total eye candy I am sure! Ok, that will do it for Munich 2005. See you all here again in November, 2006!